Apple announced the iOS 8.1 beta yesterday for the iPhone, iPad and the iPod Touch. The update is expected to come with several changes on board. These include fixes for several issues present in iOS 8 and iOS 8.0.2. As much as an ordinary user would love to install this latest iteration of the iOS on their devices, the software released is a beta version for developers only. And that requires paying $99 to register as Apple’s registered developer.But there is a workaround this pesky charge. If you’re willing to install the latest beta on your device then you might be able to do so in a few simple steps. To download the iOS 8.1 beta ipsw file for your device, visit and register at ATFDL.com. Folks over at ATFDL promise an iOS 8.1 beta soon, so stay sharp to get the software for your device. It might be worthwhile to see what tricks Apple has up it’s sleeve with it’s latest iOS release. Earlier today, developer Hamza Sood managed to find evidence in iOS 8.1 for Touch ID compatibility with the upcoming iPads. After you have downloaded the ipsw, follow the instructions below. As usual, before starting, the pre-update ritual remains the same. Backup all of your data using iTunes or iCloud. Backing up is more important in this case as installing the beta might require you install upgrades as they come or loose device access if the beta expires. You will need to perform a full restore of your device in case this happens. 1) Start iTunes And Connect Your Device. After you’re done downloaded, connect your device to iTunes and start Apple’s software up. In the device summary menu, Shift Click (Windows) or Alt Click (Mac) the update device button. This will open up an explorer tab and allow you to select the IPSW file you just downloaded. 2) Select The iOS 8.1 Beta IPSW File That You Have Downloaded. 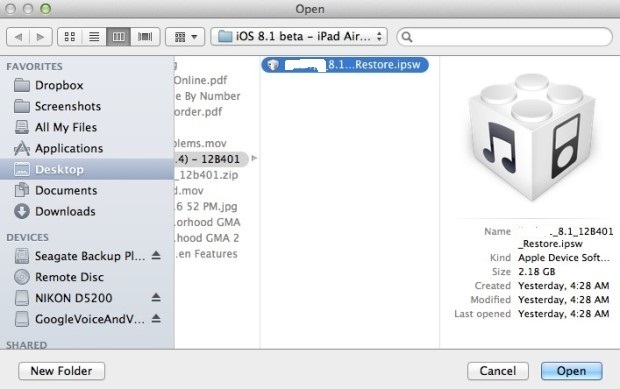 Select the iOS 8.1 beta ipsw file that you have and click open. iTunes will then proceed to install iOS 8.1 beta on your device.